Preserving wood against weather and insect damage extends your fence's life, and your budget. Preservatives can be factory applied, like chemical pressure treating; applied at the time you put up the fence, like creosote; or applied on a yearly basis, like waterproofing liquid. Using the correct preservative will help your fence last a long time, meaning more time to enjoy your garden, yard or meadow. Several kinds of preservatives help wood fencing last a long time. Pressure-treated lumber dominates the outdoor building market because of the strong protection it provides against weather and insect damage. Lumber is saturated in a solution of copper salts under intense pressure, which forces the solution deep into the wood. Compounds used until 2004 contained arsenic as an insect repellent but have been replaced by several formulations, the most successful of which has been alkaline copper quat, a mixture of copper salts and mildewcide fungicides used in smaller quanities in household cleaners. The high potential for chemicals leaching into adjacent soil and watersheds has led the USDA to prohibit the use of pressure-treated lumber in organic farming. 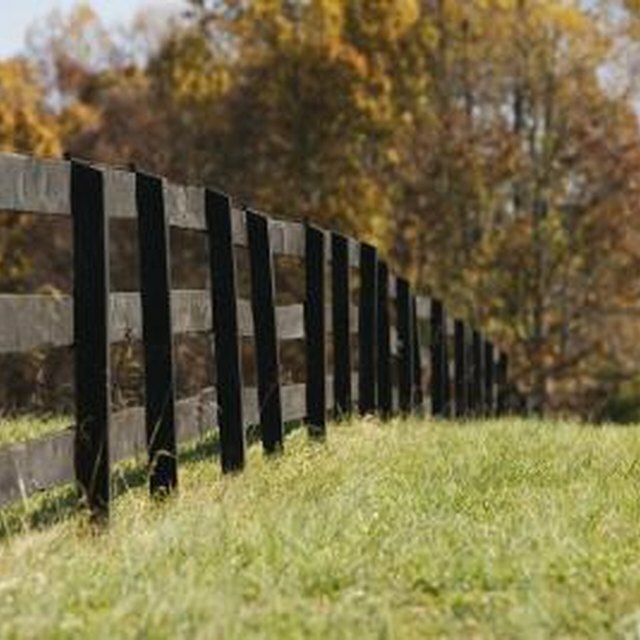 Treated can be used to contain livestock or fence crops only if a barrier has been provided to prevent contact, and alternatives to pressure-treated lumber are strongly encouraged. It is also no longer permitted in the manufacture of children's play equipment. Creosote, a petroleum compound, can be used to waterproof fence posts when they are first set in the ground. Paint the ends that will be sunk into the ground with creosote or a similar post-protecting compound, leaving a short collar of 1 to 2 inches of creosote above ground. This will protect posts but again at an environmental cost, because creosote and its relatives contaminate groundwater as they and the wood they protect age. Paint-on products are composed of USDA approved household chemicals in an organic solvent or water base and usually require annual application to maintain their effectiveness. They repel insects, reduce mildew and fungal infestations and protect against airborne moisture. Their major disadvantage is the protection of surface, not undergound, wood; underground contact with moisture and organisms is often the beginning of problems. Further, these products need frequent applications to maintain effectiveness. Concern about the contribution of volatile organic compounds to air pollution may result in more water-based products. Choosing fencing timber that is naturally more weather and insect resistant than other kinds is a chemical-free strategy. Both red cedar and black locust have historic reputations for long service as fencing, lasting up to 25 years. Redwood, white oak and burr oak are also regarded as highly durable, serving as fencing for 10 years or longer. The US Department of Environmental Protection lists wood and nonwood alternatives to pressure-treated wood, among them composite lumber. This is manufactured from wood sawdust and recycled plastics. Still more expensive than some varieties of wood and very heavy, composite lumber may have limited uses for fencing. Vinyl and high-density polyethelene lumbers are less costly and appear in an increasing variety of styles especially around suburban yards.